"Open House" by Lowell Boileau was completed on September 15, 2007, by coincidence the day that the 114 year old William Livingstone house was demolished. The micropointillist painting process is blogged by the artist on the DetroitYES forum. Click here to follow the process from drawing to final splashdown. I am not a realist; I am a possiblist. 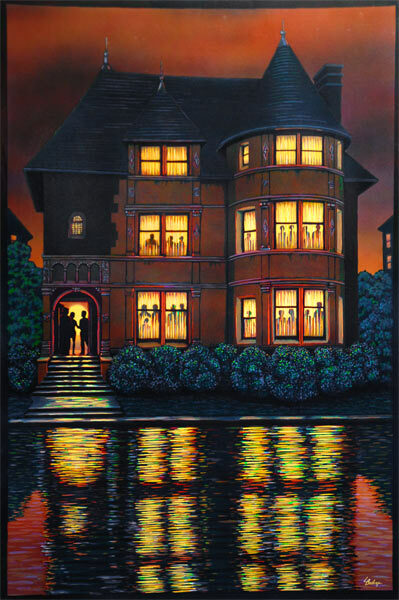 “Open House” is a possiblist painting based on the William Livingstone House which stood a little more than 2 blocks from the Intersection of Woodward and Martin Luther King. The house is renowned for being the first design by a young [soon to be superstar architect] Albert Kahn. Built in 1893, its existence came to an end on September 15, 2007, by coincidence the very same day the painting “Open House” was completed. The name ‘Open House’ contains a double entendre. In the painting, guests arrive at an illuminated open house party. Accompanying the painting is a print-out of the house in its last days showing the 114 year old Livingstone House ripped wide open by the forces of nature and the results or a poorly executed attempt to move the house in the 1990’s. 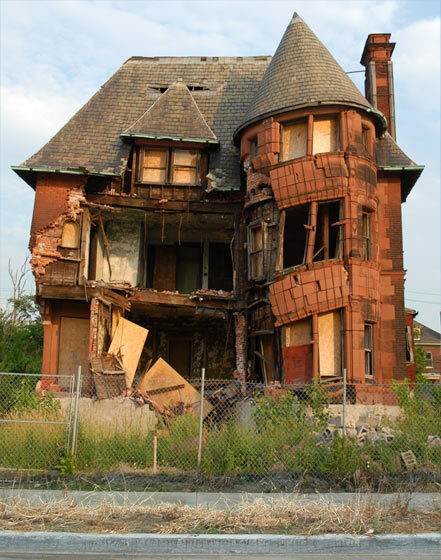 Its sagging turret earned it the name “Slumpy” among the Detroit community of urban photographers. In its existence the Livingstone House encompassed many aspects of the Woodward and Martin Luther King intersection over time. In its early days it was the gilded age home of a Detroit luminary and the first project designed by Albert Kahn who would go on to international fame and to become the most influential architect of his generation. As the city of Detroit grew rapidly at the dawn of the automobile age, the formerly exclusive Brush Park district declined into decay and abandonment. The Livingstone House, like many others around it, was converted into a multiple unit rooming house, then finally abandoned. In its sad closing days, its pathetic and sagging façade became an attraction to photographers, who dubbed it “Slumpy”, and a symbol of both the problems and possibilities a reviving Detroit offered. Today, like the Intersection, much of Brush Park is reviving and many of its former mansions are being restored. Unfortunately “Slumpy” did not make the cut, but its memory will continue in hundreds of pictures on the internet and with the painting “Open House”.